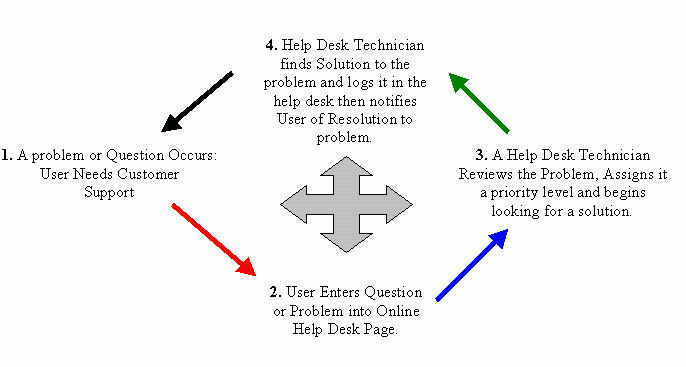 It is important to understand the process of how help desk questions are answered. A properly tuned support staff will use online web based help desk software to expedite question answering. Forces Users to think logically about their problem before submitting it to the help desk. This increases the possibility that the end-user will solve the problem without outside help. Frees up phone lines allowing more critical calls to get threw. Creates a centralized repository for all support calls, allowing staff to quickly review previous questions in order to expedite common question resolution. Below you will find a flow chart of how a typical help desk call will be handled using our software.